Infineon emphasizes cost/performance for silicon carbide while considering some hybrid combinations. The search for new materials to replace CMOS has been in full swing for decades, but in spite of successes in limited niche markets, bulk CMOS remains king. That’s beginning to change, however, as CMOS runs out of steam at advanced process nodes and as the priorities of chipmakers change from pure performance to energy efficiency. And for such applications as automotive electronics for hybrid and electric vehicles, silicon carbide is really beginning to catch on after years of promises. The downside is silicon carbide is that it is more expensive, and Infineon has been emphasizing total value when comparing an SiC Schottky diode and FET with a silicon IGBT. It may sound like a familiar chorus in the semiconductor world, but this one appears to be gaining traction. Fig. 1: Peter Friedrichs pitches total value. Until now, the cost/performance consideration has been the primary criteria for choosing between tried and true silicon transistors and Schottky barrier diode (SBD) SiCs. But Peter Friedrichs, senior director of Infineon’s SiC Department, said the choice has nothing to do with whether it’s the best technology or even a new technology. In fact, the company has been shipping SBD SiCs since 2002 and is now investigating the cost performance of an SiC SBD at the system level. 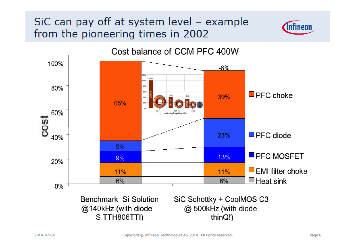 Case in point: Analysis shows that a 400W power-factor correction (PFC) control system using Consecutive Conduction Mode (Figure 2) can result in an estimated 8% cost reduction using a combination of CoolMOS C3 (Infineon’s Si power MOSFET) and SiC SBDs for the transistor, rather than a combination of a traditional bipolar power transistor and diodes. The total cost of CoolMOS and SiC SBDs is higher, but its high-speed operation allows an increase in switching frequency from 140kHz to 500kHz. As a result, the PFC choking coil can be downsized, thereby reducing the cost of the coil. Fig. 2: Use of SiC’s diode for Power-Factor Correction system shows a cost reduction. Source: Infineon. The company has been considering using MOSFETs and junction gate FETs (JFETs) as SiC transistors since 1992 (Figure 3). The difference is that in a MOSFET the electrical current flows through the surface channel of semiconductors, while in a JFET it flows through the bulk. As a result, in MOSFETs resistance can increase and reliability can suffer due to roughness of the surface or the interface state. In contrast, the electrical currents in JFETs only pass through the bulk, avoiding those problems. There is another problem to contend with, as well. In a normally “on” operation it is necessary to have a reverse bias to turn it “off” as the current can flow even when a gate voltage is zero, which is not very user-friendly. Infineon said that in MOSFETs an interface defect can cause an early failure and continue to degrade while the device is operating. Therefore a special screening phase is required. This isn’t so easy, which is why the company decided to promote JFETs instead. 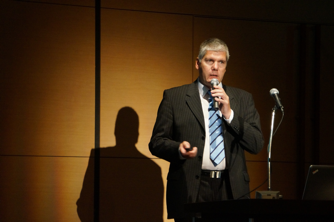 Kenji Tsuda is editor in chief of Semiconportal, a Japanese-based content sharing partner of Semiconductor Engineering.